Would you read a soap-opera on Facebook? Ndreams – digital games producers are betting that people will. 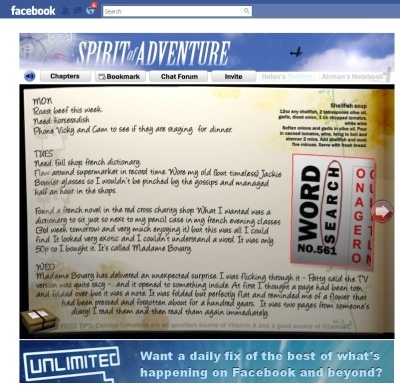 They have created an interactive multimedia story and made it into a Facebook app, called the Spirit of Adventure. Part game, part story book, part forum it’s one of those things that ticks all the multimedia boxes. I have a lingering doubts about whether these crazy mutliplatform things actually deliver on their promises or just come across as novels with lots of gimmicks getting in the way of the story. Anyway. The story is about a lady called Helen Hobbes, a housewife who lives a happy life until she makes a discovery that leads her to abandon everything; her family, her home and her loving husband to go on a quest for a mysterious man who she doesn’t even know yet. New episodes will be released every Thursday. “One of the things I love about Spirit of Adventure is that we’ve taken the traditional concept of story-telling and said, ‘Let’s see what we can do if…’ So it’s not just text – there are drawings, photos, letters that you can open and read; you can follow and help Helen via Twitter…” said Christian Wheeler, writer. Hmm, let us know what you think of it in the comments. I totally understand having favorite cast members but don’t fault the show for actors wanting to move on…it makes you sound pretty immature actually. It’s a great show and I will not miss an episode as long as it’s on. The writers and the actors did an amazing thing…introducing new charactors to replace some originals can’t be easy but I am as connected to all of them as I was Peyton and Lucas. The show still ROCKS! It got way to Soap opera like and even immature. the story lines were so stupid and just became one … Im sick of them ruining what made tree hill, tree hill in the first place. … You have to understand, that there were not other options.